At Cambridge Country Manor on Tuesday July 24, 2018. Doris (Lamont) Lamb at the age of 93 years. Wife of the late Jim Lamb (1994). Dear mother of Ruth Lamb of Waterloo, Jane Woolven (James) of Fergus, David Lamb of Guelph. Sadly missed by her granddaughter Sarah Lamb (Jared MacGregor) of Kitchener and her great grandson Callum MacGregor. Predeceased by her sister Mary Hedge. 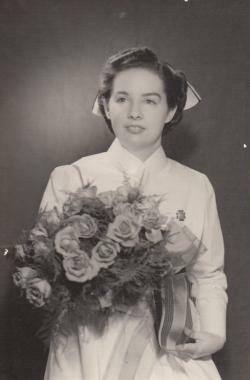 Doris was a graduate of the Guelph General Nursing School, class of 1946. She nursed at Homewood Health Centre and volunteered at the Lapointe-Fisher Nursing Home for many years. The family would like to thank the staff at Cambridge Country Manor for the care Doris received. Cremation has taken place. The family is having a private graveside service at Woodlawn Memorial Park. Memorial contributions to Cambridge Country Manor or any charity of your choice that involves animals. Arrangements entrusted to the GILCHRIST CHAPEL – McIntyre & Wilkie Funeral Home, One Delhi Street, Guelph, (519-824-0031). We invite you to leave your memories and donations online at: www.gilchristchapel.com and they will be forwarded to the family.